AGT Alumni Updates and Should You Read Mandy Harvey’s “Sensing the Rhythm”? 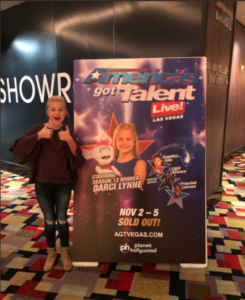 “Amercia’s Got Talent: Live!” featuring Season 12 fan favorites Darci Lynne Farmer, Angelica Hale, Light Balance, and Preacher Lawson is happening in Las Vegas this weekend. The two initially planned performances sold out so quickly they added two or three more, and then those went fast as well, so they should get a good turnout. Unfortunately, I won’t be attending (though I did get to see Season 11’s Tape Face do his thing up here in Canada this past Saturday) but I’ll be sure to update with a roundup of social media, pictures, and any other fun stuff from the event next week! (Photo from Darci’s Twitter). 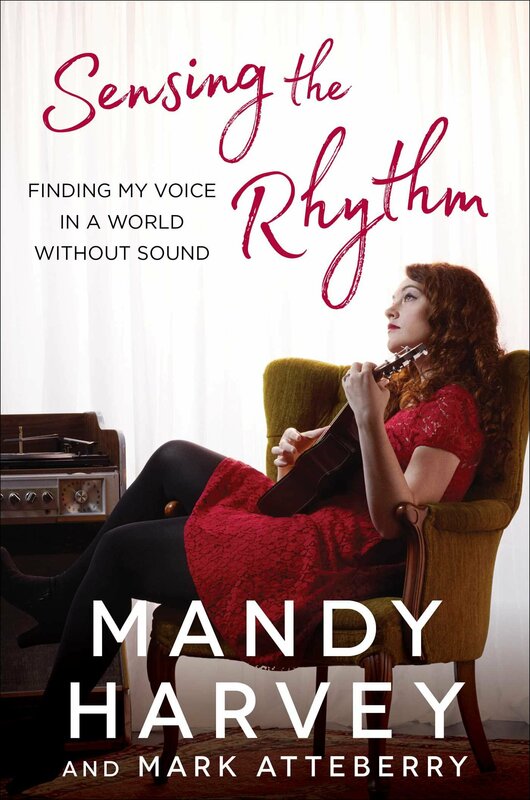 Lastly, I’ve been meaning to cover Mandy Harvey’s book Sensing the Rhythm, which was released about a month ago and is currently available in bookstores and online. Sensing the Rhythm mostly covers Mandy’s life from around the time she lost her hearing to the present as of when the book was being written (a little less than a year ago from when I’m posting this in October 2017) though there are a few stories from her high school days and before peppered in. The book has an easy-to-follow, feel-good format with each chapter starting with an anecdote from Mandy’s life, followed by the lesson(s) she learned from the experience and advice to readers who may be facing similar challenges and does a great job at translating these takeaways to other situations people may be dealing with. So while the stories mostly focus on her hearing loss and music career, the book overall is about overcoming adversity, and that’s a challenge virtually everyone in the world faces at one point or another. Since the book was finished before her season of AGT began, there isn’t any juicy behind-the-scenes dirt on her experience competing on the show. However, we do get some interesting and insightful background information on her family and love life (SPOILERS: she’s married, so sorry to crush the dreams of all the people who ship her with certain other AGT contestants :P). These sections of the book are the most personal and raw of all; I was surprised she even opted to discuss some of the things she did, though I think they probably helped paint a more authentic picture of Mandy as a person, and I would definitely recommend this book to anyone who enjoyed Mandy on AGT or are just curious to know more about how she was able to continue composing and performing music after losing her hearing. This is gonna be short because I just got home from vacation (I watched last night’s episode from my hotel room in the middle of a thunderstorm). This week’s list will start with who I think is LEAST likely to win tonight and go from there. I won’t say much else besides the names right now, but I’ll be doing a season wrap-up post once we know the results so I’ll go into more detail on things there! Not sure this is EXACTLY how things will play out but I do think the Top 5/Bottom 5 will look like this in some order or another. My Final 2 could be flipped, but I honestly don’t see anyone other than Grace or Brian winning (though I GUESS there could be a small outside chance of it being Jon or The Clairvoyants). But yeah, that’s it for now. Looking forward to the finale and rehashing it over here soon afterward! And as a reminder, this is a list of what I THINK the results will be, not necessarily what I’m hoping for. 1. Grace VanderWaal – The hype for this girl continues, and doesn’t seem like it’s letting up anytime soon. I found Grace’s performance last night pretty forgettable myself, but it seems America has fallen in love with her, and I’ll be very surprised if she isn’t one of the three automatically advancing acts tonight. 2. Tape Face – In all honesty, this spot and the next one are pretty much interchangeable. Both acts seemed to get a very positive reaction from viewers, and have gotten a lot of buzz throughout the season in general, but I think there’s a chance one or both of them could end up in the Dunkin’ Save. As for Tape Face’s performance last night, I enjoyed it but I think I enjoyed the package preceding it even more! 3. Laura Bretan – Between performing last-AGAIN-and the story about her grandfather, I have a feeling she’s making it through to the Finals, but I’m still not quite sure if opera is popular enough for her to crack tonight’s top three. I’m going to tentatively guess it is, but we’ll see. 4. Musicality – This was the other major tearjerking story of the night, but unlike their showing in the Quarter-Finals I think their performance actually backed it up quite nicely, and I predict that one way or another, we’ll be seeing them in the finals. 5. Malevo – They were good before, but they really stepped up their game last night to give us a very unique performance.They may end up in the top three tonight, but after being on the bubble last week I’m thinking maybe not. But I think their standout performance and their running order spot will be enough to get them into the Dunkin’ Save again. 6. Jon Dorenbos – No doubt that this guy has fans, both from the football world and now from this show. But I saw a lot of comments calling his act last night “messy” and I think he may have gotten lost in the shuffle a bit because of that. But I think there may still be hope for him if he managed to get into the Dunkin’ Save zone. 7. Sal Valentinetti – Again, like Jon, Sal seems to have a substantial following among fans of the show, but I fear he may have gotten lost in the shuffle last night (and going first probably didn’t help). If he makes the Dunkin’ Save again I think he might squeeze his way into the finals, but at this point I’m not sure whether or not he’ll be there. 8. Edgar – I love this family, and they gave a great performance last night, but I think this is another act that might not have been in the forefront of a lot of people’s minds when it came time to vote. But I do think they have a shot at making the Dunkin’ Save. 9. Deadly Games – I was very impressed at how much these two stepped up their game and added some nice variety to their act, but for whatever reason I get the feeling the audience has already chosen their favorites, and this act just might not be one of them. They MAY have cracked the top six for the Dunkin’ Save, but sadly I feel like they didn’t. 10. Blake Vogt – Another act I loved, but, due to running order and being up against another magician that I get the feeling might have more backers, I have a feeling his time on the show will be up tonight. 11. Lori Mae Hernandez – I think Lori has improved over the course of the competition, but I get the feeling that a lot of people don’t like her (whether it be for political reasons after the last time she was on or because they simply don’t find her funny) so I’m think she’ll be another act going home tonight. I’m not even gonna touch the Dunkin’ Save possibilities this week because there are just too many variables at this point in the competition. Now let’s see how wrong I am this week!